Pete Magnani managed the technical training classes at IBM’s mid-Hudson Valley sites. He had created the test training class due to lack of teaching on this topic at college. The class lasted ten to twelve weeks, with each class session held for two hours. Each week we had a different IBM employee lecture about equipment, methods or computer programs related to testing. In this class, I became enthralled with defects, equipment, and equations. My introduction to Weighted Random Patterns came in this class taught by Franco Motika. I came back from that particular class and shared my excitement about this topic with my second line manager. One week I arrived late to class. As I attempted to be non-disruptive while taking my seat, Pete thrusted the survey into my hands. He said “You write really good feedback. I want to know what you think.” With his statement I learned that even as a new IBM engineer I had something worthwhile to contribute to the experts. In engineering, continuous improvement is essential. Requesting feedback assists in knowing where to focus that improvement. As owner of the class, Pete read all survey responses so the next training would be better. Businesses who value their employees train them to be their best. I had a great start at IBM. This class not only intellectually informed me; my classroom experience informed me that opinions do matter. In addition, it ignited my passion for finding defects and led me to my work assignment on Weighted Random Patterns. I would never have pursued a career in semiconductor testing without my IBM training and work experience. Dear Reader, What comment or question does this piece spark in you? Have you ever provided feedback that was acted upon? 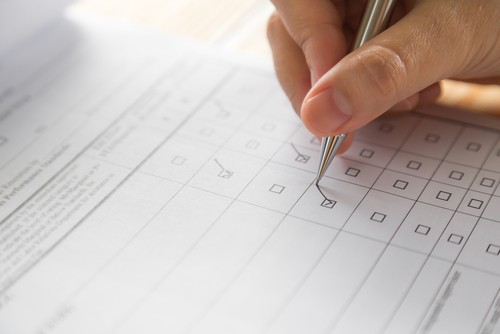 How do you respond to surveys? Please share your comments or stories below. You, too, can write for the Engineers’ Daughter- See Contribute for more information.